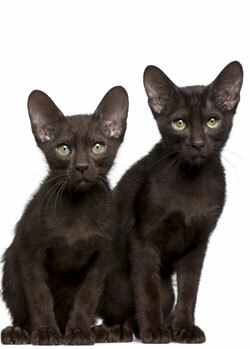 The Havana Brown, one of the breeds tentatively identified as the 19th Century Swiss Mountain cat, is a breed of cat well known and shown in England in the 1890s. Similar to the oriental shorthair, full colour cats, also known as non-blue eyed Siamese, were known to interbreed with the pointed cats of Siam. The Havanna Brown originated from Thailand. In Thailand at the time they believed that brown cats were a relinquish from evil. They were then brought to England in the 1800's. During World War I and World War II, the breeding programs of pedigreed cats suffered. It was not until the post World War II era that cat fanciers renewed their breeding efforts. In the early 1950s a group of English cat fanciers began working together to restore the breed. While the breed developed in the UK became the Chestnut Brown Oriental and retained the Siamese conformation, it was developed in the USA to have a different head shape and became the Havana Brown. The Havana Brown is not recognised in Britain in this form. he Havana Brown is an intelligent cat that often uses its paws both to examine objects and to communicate with its owners. The most likely explanation of the breed's name is that its coat colour is very similar to that of Havana cigars, however, some have also argued that the breed's name is also derived from the Havana (rabbit) which also shares the colour. The breed has been recognised for championship competition in both the US and Britain since the late 1950s. It is considered an endangered breed, since the breeding pool is very small. In the late 1990s, there were only 12 Cat Fanciers' Association-registered Havana Brown catteries and under 130 unaltered cats.